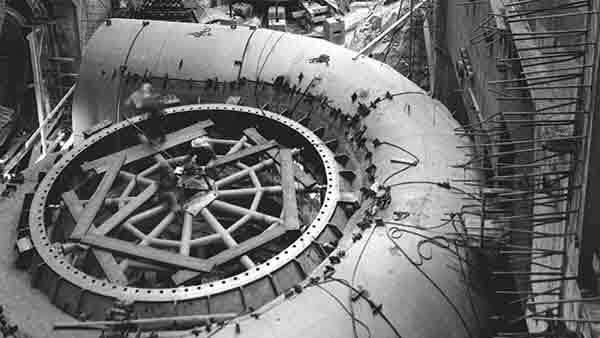 Construction of the W.A.C. Bennett Dam in northeast B.C. started in 1963 and was completed on Sept 12, 1967. 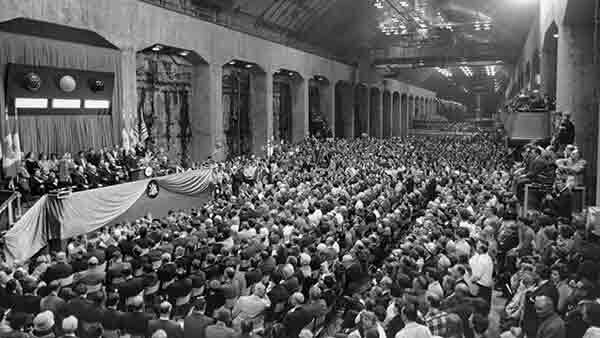 But it wasn’t until Sept 22, 1968 that more than 3,000 people squeezed into the powerhouse to watch Premier W.A.C. Bennett switch the generating station on for the first time. 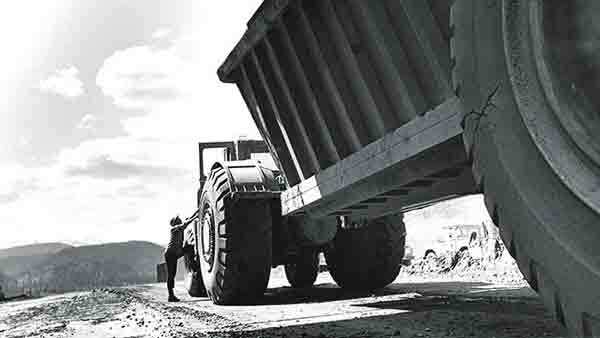 Huge 100-tonne belly dump trucks were used to haul materials to the dam site in May 1965. 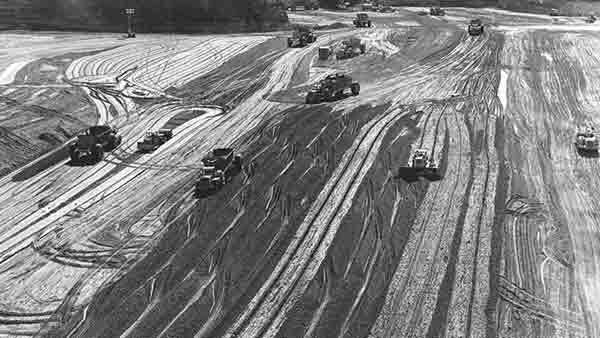 Machines swarmed over the rising dam as fill placement work reached its peak in June 1964. The tailrace tunnel, which dwarfs the worker in the lower right of the image, was built to return water to the river downstream after its used hydroelectric generation. These intake towers draw water from the reservoir into the penstocks located beneath the towers, which are still clearly visible today. 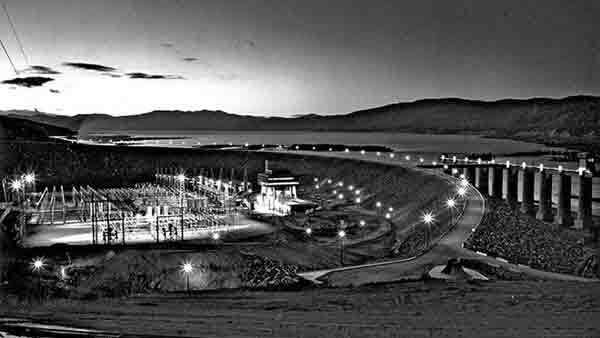 Night view of the dam before the 674 million cubic metres of water filled Williston Reservoir, by far the largest in BC Hydro’s system. Originally from Nova Scotia, Chris O'Riley arrived in B.C. at age seven, in part because his dad – retiring from the navy and looking for new prospects – had heard that B.C. was the land of opportunity. "The navy would send my dad anywhere in the country and he picked here, which is pretty much as far away from Halifax you could go," recalls O'Riley, BC Hydro's new president, but now in his 27th year with BC Hydro. "He told me about reading about B.C. in a Time magazine story and all the things being built, including the dams. He thought it was a chance to have a better future for our family, and it turned out to be just that." At the top of B.C. 's 1960s construction list was the W.A.C. Bennett Dam, which turns 50 on September 12. The dam on the Peace River in northeast B.C. remains our biggest asset, which was considered an amazing engineering feat when it was built between 1963 and 1967. 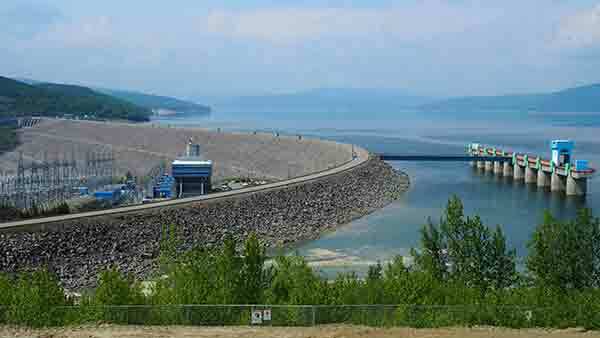 And the water in its reservoir still accounts for a quarter of all power being generated by BC Hydro. Not only does the dam's anniversary coincide with O'Riley's early days as president of BC Hydro, it comes at a time when a third dam on the Peace River, the Site C Clean Energy project, is under construction. Most significantly, the dam is facing a review by the British Columbia Utilities Commission that will inform the new BC Government in its decision whether or not to continue construction of the dam. 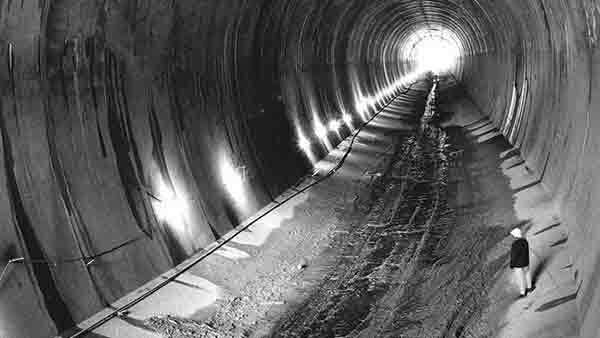 bchydro.com editor Rob Klovance recently sat down with O'Riley for a wide-ranging Q & A that not only looks back at the mixed legacy of the W.A.C. Bennett Dam, but at how differently BC Hydro works with First Nations and environmental best practices today, and at the role hydroelectricity plays in B.C. 's future. Chris O'Riley, now BC Hydro's president, speaks at the opening of the Bennett Dam Visitor Centre's First Nations gallery, "Our Story, Our Voice", last year. Rob Klovance: You've been a member of BC Hydro's executive since 2007, and in your 27 years here you've been involved in everything from upgrades to our generating facilities, to customer care, and even our corporate risk department. How did you get your start here? Chris O'Riley: "A week after graduating from UBC, I started as an engineer-in-training at John Hart Generating Station at Campbell River. And it's the best move I've ever made. When I was in school I had a summer job in pulp and paper, in Port Alberni at what was then the MacMillan Bloedel mill, and is still one of our biggest customers. And I was thinking about going into that industry. But even back in 1990, they were experiencing a downturn and weren't hiring anybody that year. So as an electrical engineer, BC Hydro seemed to be an obvious option. It seemed like a great place to go, and my dad thought it was great, fantastic that I was going to work for BC Hydro." RK: And now you're BC Hydro President at a pivotal time for the utility. What excites you about your new position? CO: "I think what we do is so important to people's lives in B.C. The service we provide and the choices we make affect the lives of people in the province, and not just today, but for generations in the future. "I've been fortunate in the last 10 years to be involved in a lot of building, so I feel a strong connection to the people who built our assets originally and to the people who will benefit from the investments we're making now, in the future. The assets we're building last, so there's a sense of... permanence is probably a bit of an exaggeration... but there's a long tail to the decisions we make. The decisions we make here have lasting effects, so you have to make good ones." RK: Let's talk about the W.A.C. Bennett Dam. What makes this 50-year-old dam so special? CO: "The scale of the ambition was remarkable. It's hard to compare to today. People talk about Site C and say it's the biggest project we've ever done, but that's not true at all. Site C will be the fourth largest dam in our system. It's big, but not the biggest. Bennett was a massive undertaking. For the population of B.C. at the time [1.8 million compared to 4.7 million today], and for the size of BC Hydro, it was unbelievable to take that on. "What struck me is that they hadn't yet fully commercialized the technology to transmit the power to Vancouver when they decided to build the dam. That's just an indication of the ambition. That technology wasn't ready yet. So by the time they started construction of Bennett Dam, it was a risk to get power to the city, and a challenge to be overcome. To do that today would be incomprehensible. Your risk-management practices wouldn't allow you to do such a thing." BC Hydro President Chris O'Riley says this pretty image of the W.A.C. Bennett Dam and Williston Reservoir doesn't tell the full story of the dam's impacts. The way First Nations people were treated when the dam was constructed in the 1960s is a "terrible stain on the history of the province," says O'Riley. RK: At the opening of the new First Nations "Our Story, Our Voice" gallery at the Bennett Dam Visitor Centre last year, you talked about how an iconic picture of the dam and reservoir obscures the full story of its impacts. That story is about First Nations people being forced to move their homes and communities because the reservoir flooded their villages and disrupted their transportation routes. How was that allowed to happen? CO: "The Bennett Dam was constructed in a different time. There was no dialogue or engagement, no opportunity for discussion or accommodation. First Nations were considered to be people in the way, and that's how they were treated. It's a terrible stain on the history of the province." "The dam was built in a completely different context. It was before Aboriginal rights were recognized in the Constitution, before the Supreme Court had established expectations around First Nations consultation and accommodation. And it was at a time when people didn't understand Aboriginal rights – we still had residential schools, and people weren't aware of what went on there and what that meant to people who were forced to go there. "The agreements were an important step, but they were just a step on the path to reconciliation." RK: Has BC Hydro done enough to make amends to those First Nations? CO: "We signed financial settlement agreements to resolve historical grievances with the Kwadacha and the Tsay Keh Dene First Nations, agreements that took years to negotiate. The agreements provided some benefit, but only a measure of closure for BC Hydro and the people who were impacted. At this point it was almost two generations later, and I'm still struck when I go up there at the very current sense of injury that people carry with them, even today. It's a reminder that some things you can't fix with money. "The agreements were an important step, but they were just a step on the path to reconciliation, just a start. The [First Nations gallery at Bennett Visitor Centre] was another step, and you'll notice when you go there that there's a significant contribution from the Kwadacha First Nation. But there's just a little placard from the Tsay Keh Dene that says they just weren't ready to be part of this. We included the placard because it's part of the story as well." RK: You also said at the First Nations gallery opening that we won't repeat the mistakes of the past. How are we ensuring that doesn't happen? CO: "We sometimes get accused of making the same mistakes again with the Site C project, and I appreciate why people might feel that way. But I think if people step back and look at what we've done, that's not really supported by the facts. There's been many, many years of consultation and engagement with First Nations, and we have six agreements with Treaty 8 First Nations for the Site C project that include benefits for communities, and commitments to procurement. "Procurement is important because it helps build capacity for employment in those communities. Contracts provide employment and help people grow in their abilities, and they can apply those skills in other projects. It's beyond employment. It supports entrepreneurship and ownership and capacity building in those communities. "We've had over $150 million in Aboriginal and First Nations procurement on the project so far, and that's continuing to grow." This scroll case was used to direct water for the first turbine installed in the GM Shrum Generating Station at W.A.C. Bennett Dam in June 1967. RK: Much has also been made about the environmental impacts and the loss of agricultural land in the Peace River Valley at Site C. While the project will produce 35% of the energy of Bennett dam from a reservoir only a 20th of the size of Williston, the reservoir formed by Bennett Dam, there are those who say the environmental impacts are still too great. What's so different about Site C? CO: "The environmental standards and practices when Bennett was built were pretty limited. There are some awful images of the way the reservoir was cleared, and in many cases it wasn't cleared. The trees were just left. In other cases, standing trees were just knocked over en masse with chains stretched between bulldozers and dragged through the woods. The consequence of all that is that the reservoir was choked with debris for many years and it was very difficult to travel on." "This time, we're removing all the trees on the reservoir. We're cleaning it up. That's just one example of how we're doing things differently today." "Site C has gone through a three-year independent joint federal-provincial environmental panel, and coming out of that there were 150 very strict conditions imposed on the construction." RK: The new government has delivered on its election promise to submit Site C to an independent review through the British Columbia Utilities Commission. How confident are you that construction of the dam will continue? CO: "Our job in the review is to put forward objective, fact-based information so that the BCUC can make a determination to help the Provincial Government make a decision on Site C. As our shareholder, whatever decision they make is, by definition, a good decision, the right decision. "I have worked my whole career with hydroelectric dams, and they have some unusual features that are beneficial. They last a long time, and because you spend money up front, they actually become cheaper over time as the costs are amortized while the project produces a constant amount of power. 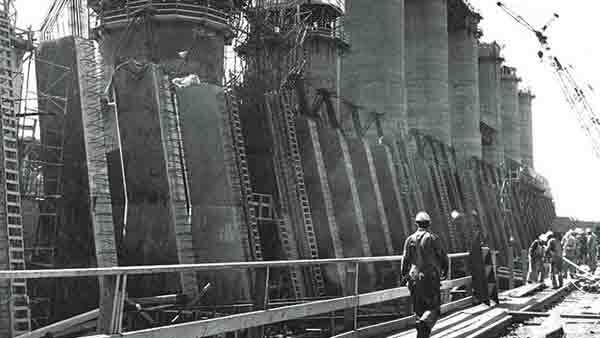 We're just finishing rebuilding the dam and generating station at Ruskin near Mission, and that was built 86 years ago. It has produced power reliably ever since and will continue to produce power for another 80 years. "There isn't a comparable asset like that where you put money up front and get benefits year after year for such a long time. We believe those same benefits will be realized at Site C. It's a unique opportunity given that it's downstream of Bennett Dam and Peace Canyon Dam. You're actually re-using the water that's already been used twice, and you're taking advantage of the upstream storage a third time." 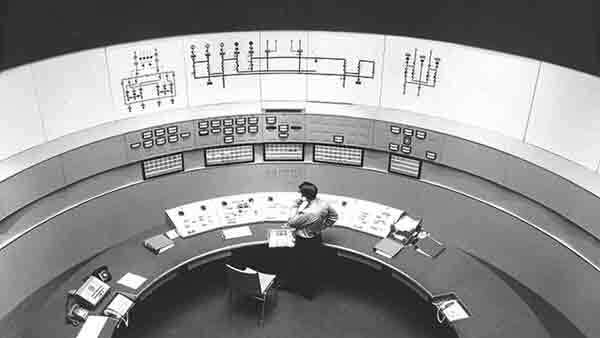 The power project's operations were directed from this control room. RK: What do you say to the critics who suggest that because of the emergence of other renewables such as wind and solar power generation, that hydroelectric dams are no longer cost-effective, "Power Smart" choice they used to be? Do you point out that even Germany, considered a leader in renewables, is still generating more than half its electricity with coal and natural gas? CO: "We're very fortunate here in B.C. to have abundant hydroelectric resources, and they've served us well for many years. Other places don't have them, and the ones they have they've already developed. So now they're turning to wind or solar. We're an excellent hydroelectric jurisdiction, but we're just an average wind and solar jurisdiction. "We have a fair amount of wind and some solar generation now. But the challenge with intermittent sources is that while they produce energy, you can't rely on it to be there when you need it. In B.C. our load, or demand for power, peaks at night, in the winter. And there's zero solar at the time of our peak load. That's a fact." 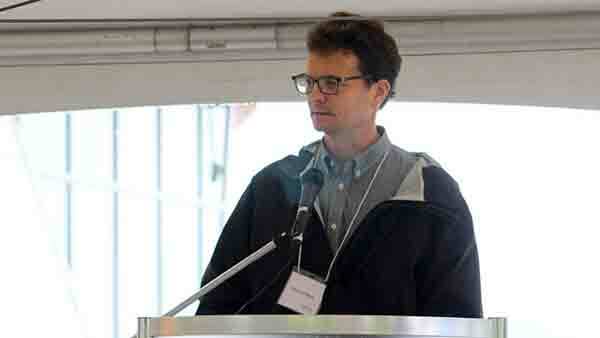 "Somehow you have to translate that solar energy into something usable for people here in B.C. And that's where hydroelectric generation comes in. It's a very powerful backbone that you can use to shape and store intermittent energy. We're strong believers in renewable energy, including hydro and wind, and we believe solar has a place here too. But it's hydroelectricity that allows you to incorporate wind and solar into the system – places that don't have that backbone struggle. It's a struggle in California, Germany and Ontario to keep it all in balance. "We have among the lowest rates in North America and among the most reliable systems in the country. We have 98%-plus clean generation, which is among the highest in the country, and we have room to support our growing economy."